Jypyä Pop (Turku, Finland) on 12 April 2012 in Lifestyle & Culture and Portfolio. Quel alignement de cannes à pêches avec le belle brillance et lumière, super. Beautiful shot, nice way to spend leisure time. @The Mouse: There's a lot, especially on Sundays for fishing enthusiasts. And that's a great place. The picture the sun is quite directly to the south and there in the background image on the right side of the island ensures appear to Turku and Naantali in the upcoming release of the ships appear. All looks very peaceful . . but, perhaps, not for the fish ! Now that is lazy fishing! The people aren't even there! Lovely weather and neat shot! Did you get any fish, though? 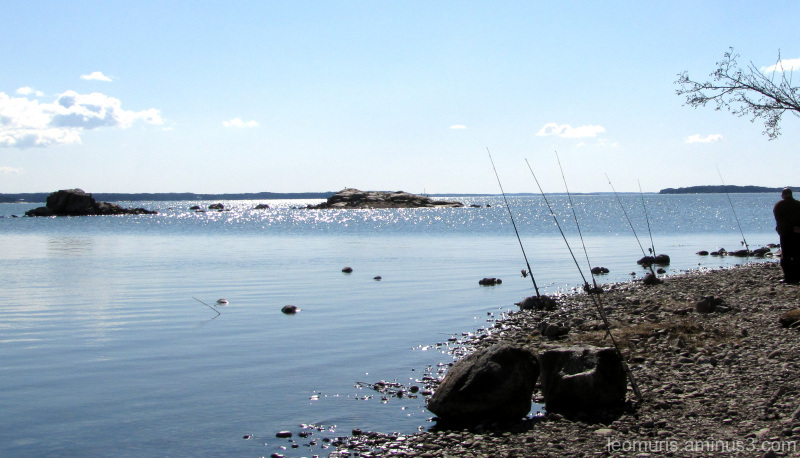 @Kristiina: I do not fish. These fishing rods are a hobbyist. I looked and I saw these birds in the Walking past.The weather was really nice. Nice image, I'd rather spend my time with camera in hand though than drowning worms !! @Doug: I agree. As a child I was with my father often just fishing, but now to me it's best to just sit on the beach and look far. A very peaceful spot. I really like this view... Beautiful shot !! @Baldwin VW: This illustrates one of the Finnish way to spend the holy days.